What is it about British filmmakers being so damn good at making horror films? Is it growing up in the long shadow cast by the suspense master, Alfred Hitchcock? Do they all come up through the ranks thinking they have something to prove? From the Hammer films of the ’60’s and ’70’s to the work of Neil Marshall (The Descent), Clive Barker (Hellraiser) and Ben Wheatley (The Kill List), the proper gentlemen from the U.K. have been scaring the hell out of audiences for years. 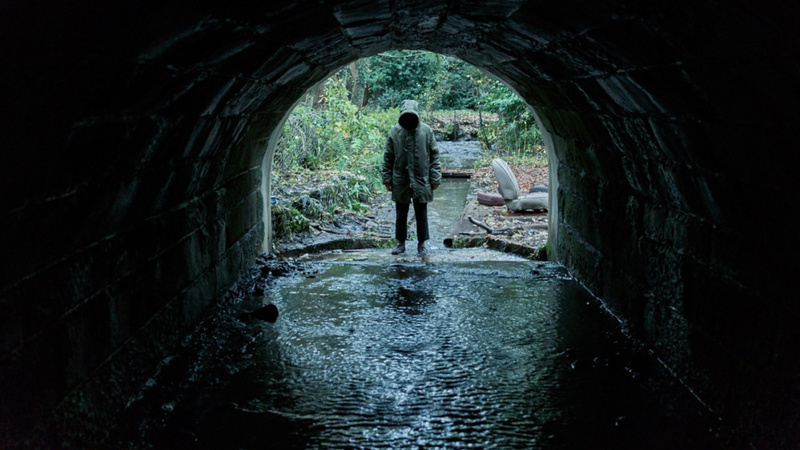 Ghost Stories, the new horror anthology from co-directors Jeremy Dyson and Andy Nyman, may not “scare the hell out of you”, but it’s creepy atmosphere punctuated by some well-timed jump scares will definitely get under your skin. The film opens with its “wraparound” story about Professor Goodman, a paranormal investigator and professional debunker who has spent his career exposing the psychics and flim-flam artists who hide their cons behind the trappings of the occult. In the opening minutes of the film, Goodman is contacted by a legendary colleague who offers some game-changing information: all of the occult and paranormal phenomena they’ve been disproving for years is, in fact, 100% … real? He provides Goodman with dossiers for three cases that will prove his theory. Each of the dossiers represents one segment of this anthology film. What follows is a satisfying blend of scares and humor held together by the compelling thru-line of Professor Goodman’s quest for the truth. In fact, Ghost Stories is that rare anthology film where the wraparound story may be the best part of the overall narrative. So many horror films stumble just before they reach the finish line. However, Ghost Stories sticks the landing and sticks it hard. It’s meant as the highest of compliments when I say I immediately wanted to see the film a second time after the final piece of the puzzle snapped into place. I want to pull on that loose thread, that inconsistency of plot that will make the whole film unravel. But, I have a sneaky suspicion that loose thread doesn’t exist, that this head game of a film will hold together just fine upon further inspection. Ghost Stories has a satisfying meta quality to its construction. It’s a film about exposing con men that’s running a long con on its audience the whole time. Film festival expectations are interesting things. The films you’re most looking forward to often disappoint, and then a film you consider to be a “throwaway” or a time-killer until something better comes along ends up being the belle of the ball. Given the talent involved in the film, I didn’t expect Ghost Stories to stink up the joint. I simply wasn’t prepared for just how good it is. It was my favorite film of the 2018 Chattanooga Film Festival, and unless it’s a crazy bumper crop of a year in the horror genre, I expect Ghost Stories to be among my Top 10 horror films of the year.